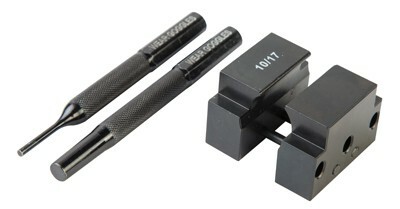 Take full control of your custom build with the Wheeler Gas Block Taper Pin Removal Tool. Whether you have a vise, or just a ball pin hammer, the Support Block, paired with the starter and finishing punches, makes removing A2 style gas blocks quick and easy. Built with durable tool steel, this is a must-have for any gunsmithing or tactical rifle owners work bench.